In our new series, Chloe Gosselin shares her quintessentially French approach to life. First up: Paris, a city she left 15 years ago, but still feels like home. Her most recent visit was to present her debut resort collection to press and fashion buyers. The timing coincided with her daughter’s summer break, so she seized the opportunity to share everything she loves about the city with eight-year-old Sky. I have so many close friends in Paris, so I try to stay with them when I visit. My dearest friends live in the Marais, which I love — it feels like visiting family. When I come for work during Fashion Week, I stay at Le Meurice. I’m more of a tea person, so when I go to Paris I take an empty suitcase and fill it with all my favorite teas from Mariage Frères. For a very Parisian experience I love Fontaine de Mars by the Eiffel Tower, especially its dessert with chestnut cream and meringue and the Île Flottante. I love the bar at Le Meurice, I always find some of my friends there during fashion week. I also love just walking around the Marais or Montmartre and grabbing a seat at a French bistro. Where do you love to take your daughter? Sky is half-French but sadly she doesn’t get to experience much French culture, so when she is with me in Paris I take her to all the museums. The Musée D’Orsay is her favorite as she loves all the impressionists, especially Degas’s ballerinas. We also go to Beaubourg and stop by the Niki de Saint Phalle fountain. 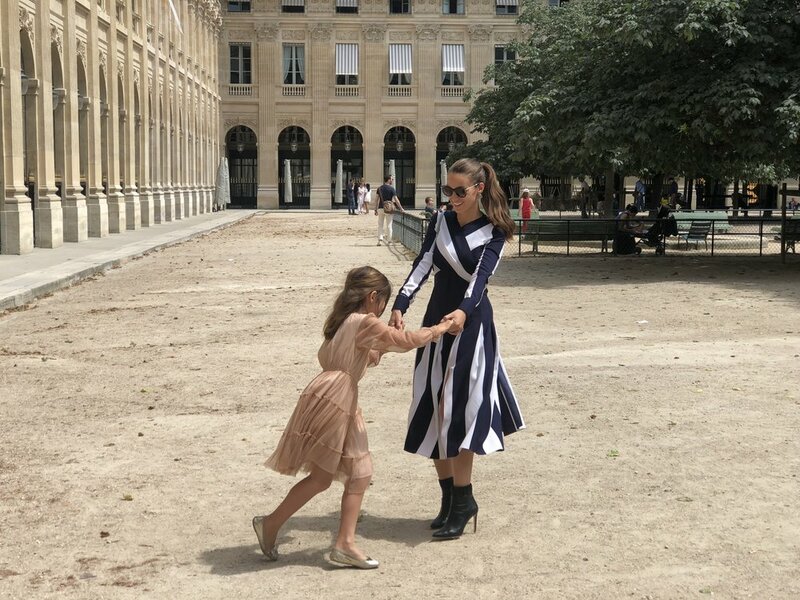 We go to the Jardin des Tuileries and visit Angelina on Rue de Rivoli for sweets. We also love to drive up to Sacré Cœur and explore the little streets of Montmartre, as well as a stop at the carousel. I love to go vintage shopping in the Marais, and always make time for Le Bon Marché. The Épicerie at Le Bon Marché is quite addictive — everything is so pretty there. What’s the most romantic spot? The Place des Vosges is so romantic, with its garden and arcades with little shops and cafés. How do you work out in Paris? I always have these big plans of going to Pilates classes but I always end up being too busy, so lots of walking is my workout in Paris. What’s your favorite hidden treasure? It’s not very hidden, but the Jardin d’Acclimation and the Fondation Louis Vuitton are the perfect combination for a magical family day in Paris.